New York State is literally loaded with little streams, creeks, rivers, and lakes. It’s a wonderfully water-ful state, but sometimes we do experience flooding. I recently blogged about our visit to see the Susquehanna River right before the historic flood of June 2006 (we had another historic flood in July that year, too). 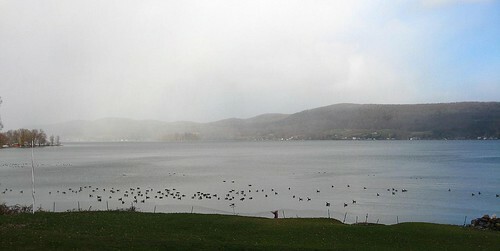 And I was sifting through my photos and found a few snapshots of our visit to Canadarago Lake, just north of Cooperstown. You can read about our visit to Cooperstown, here and Fly Creek, here. Last winter, we drove down Route 20 and Route 28 and then backtracked the same way to go home. I used to live in this area many years ago. I haven’t traveled here in a long time, though. The change from all those years ago to now was striking to me, and I can’t say it was good. This area is a very rural area. Hillsides are always dotted with Holsteins and horses, and big red barns jut out from the hills. Some of the barns are very unique in their design– there’s even an historic stone octagonal barn in this area. The houses also are very grand, built at a time when New York State was abundantly verdant and proud of her august agricultural citizens. I love architecture and pretty houses, and have always enjoyed driving down Route 20 and 28 because of all the elegant Greek Revival and Italianate houses here. I was in for a shock. So many houses and farms are now terribly run-down. Barns that once beamed their proud red colors are dingy and have broken windows. Many of the grand old dames from NY’s glory days are shamefully drab, and they grotesquely sag from years of disrepair. A few houses even had plywood and plastic to patch broken windows! It was a gloomy sight indeed. I knew that times have been very hard for Upstate farmers (and others) thanks to city-slicker politicians in Albany, but this was devastating. People can’t even keep up their houses anymore. For sale signs were almost as abundant as the browning cornstalks. My heart was bleeding. I’m sorry to be so negative in my post. I was so awed at the change that it necessitates mention. We stopped by Baker’s Beach along the lake, a favorite old place of ours long ago. 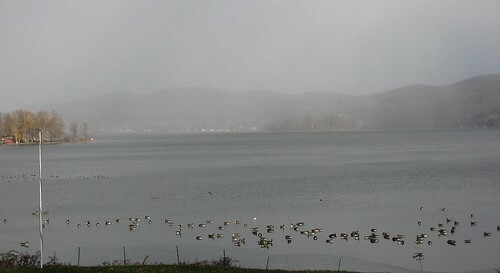 I stopped just in time to take a few photographs of a snowstorm coming in across the lake. The kids were oohing and ahhing. Can you see the storm moving in, in the photo above? The south side (to the right of the picture) was as sunny and clear as could be. The north side is filmy and foggy. The snow was coming! Geese were plentiful at the lake. Not all fly south? Or are they just waiting around for something? When I got out of the van to take the photos, all of them started honking and squeaking, and made quite a racket. They didn’t realize that my kind of “shooting” is different! I love upstate New York. I’m from California, but used to travel to upstate NY every other year to visit family near Northville. Really miss those times….you’ve inspired me to make a visit again. Thanks! Nice post. Hey Mrs. Mecomber, can you help a fellow blogger out? I’m working on updating my list of links for New York State under the US Travel by state section on my left sidebar…I was wondering if you could recommend some awesome yet unique off the beaten path travel sits for upstate New York that I could put in my link list like this one on Canadarago Lake. I need names of the sites and URLS and I’ll do the rest. Any questions, see my left sidebar or IM me on EntreCard.